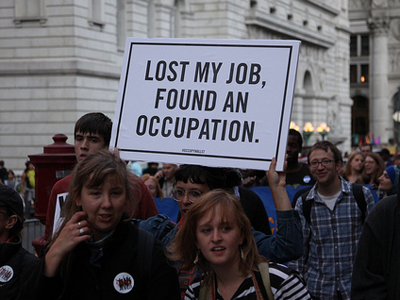 Have you read Matt Yglesias’ Saturday post on Occupy Wall Street as a rational response to a failed system? If not, do so. Now. Seriously, I’ll wait. It’s time we had a frank discussion about liberalism in our new American movement, and he’s done a great job starting it. So I’d like to write frankly here about some of the ideas found current in the Occupation of Wall Street that are, as Yglesias says, “unsound” — starting with END THE FED. This blog has remarked many times on culture wars that seem to unearth a buried conflict from American history, refighting old battles in demand of a new outcome. Opposition to the existence of the Federal Reserve has a history as long as America’s. The Federalists created a central bank to provide credit — that all-important ingredient of industry — as well as a single currency. Representing the power of southern planters, President Andrew Jackson vetoed a renewed charter for the Second Bank of the United States in 1836. After a series of recessions and panics, America created a third Bank of the United States in 1907. We call it the Federal Reserve instead of Third Bank of the United States, but that’s exactly what it is. The Fed is an artifact of the progressive era, when liberals encouraged the growth of corporations to provide employment through production. If the Federal Reserve were to be abolished — if, as most opponents of the Fed’s existence dream, we were to return to the gold standard — there would be two immediate consequences: a tight money supply in the United States, and zooming credit rates. Everything from cars to mortgages would become even more expensive, while the actual job creators would actually find it more expensive to do business. Moreover, the taxpayer would immediately lose the benefit of the Federal Reserve’s profits (about $82 billion last year). None of this helps. Yglesias picks up the point, argued here before, that the Occupation movement has to succeed by making things better; annihilating the Federal Reserve would accomplish the opposite. This is not to say the Fed doesn’t need reform or auditing, but that END THE FED is an extreme, archaic, and austerity-inducing economic policy approved by oligarchs, Ron Paul, Goldline, and hardly anyone else who understands what the Fed actually does. My sense is that opponents of the Federal Reserve system are a marginal group to this movement, though not the only one. Such adherents may, as Yglesias suggests, be brought to sanity through conversation, not compulsion. Believe it or not, this is possible. My interactions with people in the movement so far have convinced me that, for most protesters who talk about “corporations,” the existence of said corporations is not at issue. They merely want corporate power reigned in. After all, many (if not most) of the people in Zuccotti Park are employed by corporations, while the debt-burdened students on the We Are the 99 Percent Tumblr would simply like corporations to start hiring again. As I mentioned above, corporations once provided the backbone of American prosperity, and with the right policy they can do so again. Last Thursday, the Occupation General Assembly tabled a motion to adopt a third-party strategy. This is an encouraging sign, for the solution to our national malaise is not a new extreme, but a new center. In one sense, the Occupation has already done that by changing the national conversation away from austerity to prosperity. The movement will best exploit that achievement by expanding at the center, not the fringe. Why are people like Keith O. and Van Jones telling Pres. Obama that he needs to embrace and chase after OWS if OWS thinks neither party has their best interests in mind? They don’t want to be co-opted but look at the celebrity activists that they allow to speak for them. While I’m glad they came to their senses for now, that article you linked to did not help improve my feelings towards OWS at all. Oh and I totally agree with your idea of Occupy The Center. I tweeted a while ago that I don’t understand why the left feels they need to find common ground or team up with the right wing on certain policies while the middle is just sitting there.